For the past 3 months we have been building a mobile application for your smart phone and/or tablet that has a lot of useful and up to date information all in the one place and it has now been launched! No more google searching or going to different websites trying to find the tools or information you need. 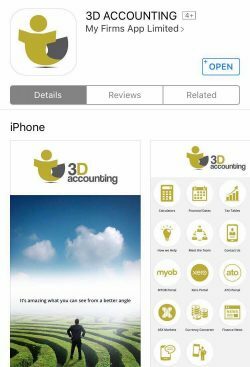 You, your staff and even friends who are not clients of ours, can download our 3D Accounting App for free – just search 3D Accounting in the App store and away you go, or click on the link on our website to take you directly to the App store. These calculators are updated regularly to ensure you have access to the most accurate information. For those using iPad and tablets (perhaps while travelling) this will be most useful and provides full functionality. For those who will only use the App on their phones, it is useful for top line viewing and reporting but not for processing as the screen size is too small. We hope to also provide links to the MYOB App and Xero App in the future (once these platforms become more widely used and stable). Very easy to use currency converter for 11 major currencies relevant to Australia. If you have a currency you use which isn’t listed please contact us and we will build it into the App in a future update. These are just a few of the many things our App is capable of. Download our App now using the below links and give it a go! We are always striving to be progressive and innovative so your feedback or suggestions about the App would be greatly appreciated. Please send them to info@3daccounting.com.au or call us on 02 4268 0070.